Cloaked in subterranean gloom is a party of visionaries determined to revive economic fortunes in a corner of South Wales where coal was formerly king. Having descended a narrow access shaft and crawled through a drain, they’ve emerged into a disused railway tunnel expecting to find salvation. It seems a long shot, but they have a plan. Their destination - almost two miles away - is a blockwall erected in the 1970s. Beyond it, the passageway has been unhelpfully backfilled; so too have both approach cuttings. There is only one escape route, hence the presence of a Mines Rescue team. Also accompanying them through the early stages of their journey is an ethereal backing track of water ingress. Some of the 300 ribs installed for strengthening purposes. Connecting the Rhondda and Afan valleys, this is the second longest railway tunnel wholly within Wales, although it hasn’t seen a train since the District Engineer shut it ‘temporarily’ on 26th February 1968 when severe distortion was recorded. Formal closure followed, a decision which owed as much to the political climate as it did to the impact of nearby mine workings. Whilst repair was feasible, diminishing traffic receipts weakened the financial case. As for local travellers, buses would soften the blow. 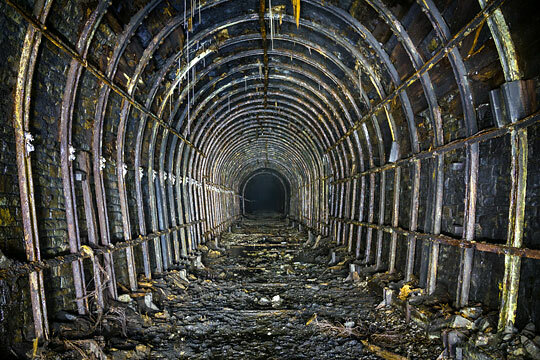 Rhondda Tunnel was buried and then forgotten as the world moved on. But with the 50th anniversary of its last train approaching, engineers are once again venturing inside to gauge its potential for reuse. It’s an unlikely turn of events, but indicative of the perceived value now placed on these assets - or liabilities, take your pick - by those keen to promote sustainable forms of transport: walking and cycling. As we discovered in February 2016 (Issue 136), the campaign began quietly at a local level, with the modest ambition of restoring the commemorative cover stone - found under a bush! - which once occupied pride of place in the north-east portal’s headwall. But the voices got louder and a grander vision was soon promoted, attracting the attention of local authorities and the Welsh government. Significant water ingress through the sidewall at the north-east end of the tunnel. Unearthing the tunnel and laying a cycle path through it could help to bring rebirth for the many communities hereabouts whose hearts were ripped out by the demise of coal. Whilst the landscape has recovered gloriously from the industry’s wounds, the healing process has proved more protracted on a social level. The area needs jobs to restore the sense of worth previously brought by mining. Wishful thinking is a human trait that afflicts us all occasionally. The road from “nice idea” to ribbon-cutting can be pot-holed, if indeed it ever gets built at all. But there is political clamour for the tunnel to be restored, no doubt encouraged by the £14.4 million of economic benefit that could potentially be reaped over 30 years, according to a Sustrans study. Considerable support is evident in the villages of Blaengwynfi and Blaencwm at either end of the tunnel, whilst the Rhondda Tunnel Society - driving the campaign - boasts upwards of 500 worldwide members and 4,000-plus followers on Facebook. Understandably however, it’s at ‘official’ level where hurdles have to be surmounted. 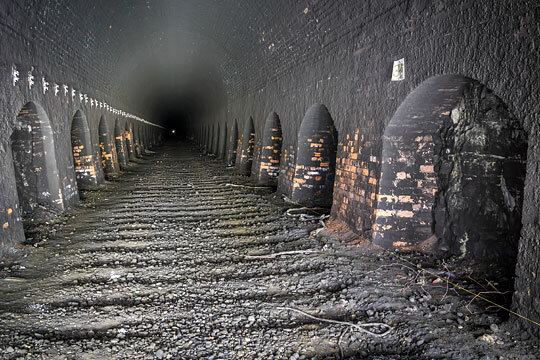 As things stand, the tunnel is one of around 3,500 redundant structures owned by the Department for Transport (DfT) and managed on its behalf by the Historical Railways Estate (HRE), part of Highways England. It has a remit to reduce the liabilities to which the DfT is exposed by each of those structures and cooperate with efforts to transfer them to third parties. Restoring Rhondda Tunnel for public use is inconsistent with those obligations; for the venture to move forward, its ownership would therefore have to be taken-on by a different statutory body. But who would want that responsibility given the ever-increasing strains on resources and budgets? Does this unique structure impose a burden that’s too far beyond the comfort zone? Whilst the noises-off are encouraging, the decision must ultimately be made on the basis of robust evidence. Many difficulties have to be overcome, but the Society is actively tackling them, having established two sub-committees to develop a business case and deal with technical matters. 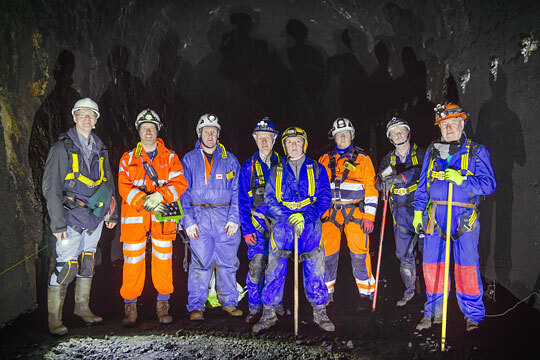 Amongst the latter’s membership are four engineers with a range of skills that include tunnel repairs and mining. Back in September, the Society received a grant of almost £91,000 from Pen y Cymoedd Wind Farm Community Fund, principally to pay for a detailed examination, together with the development of a scope of works for the tunnel’s repair and a cost estimate. Five companies were invited to tender, with the contract awarded to Balfour Beatty. A section of tunnel with a brick arch and arched sidewall, built hastily in 1890 to satisfy the Board of Trade. The approach cuttings’ infill material will shortly be the subject of a geotechnical study whilst Alpine Land Surveyors has already completed a topographical survey of the nearby land parcels earmarked to receive the excavated spoil. These could eventually host visitors’ centres, bike hire facilities and car parks, as well as camping and caravanning sites - all indicative of the Society’s sharp focus on maximising the economic opportunities offered by the tunnel. These will help to fund future upkeep and, critically, generate that much-needed employment. A site visit was arranged for early in December as a preparatory step towards the detailed examination, from which necessary insight into the tunnel’s condition will be gained; it has seen no substantive maintenance since its operational status was lost. Four of the Society’s senior team took part, along with a representative from Balfour Beatty who was keen to gain an understanding of the logistical constraints involved in the examination, expected to take place early in 2018. Forgotten Relics was also invited along. The timber cog was a precautionary measure to resist further movement of the arch where a hinge had developed. It was recognised at an early stage that getting the necessary equipment into the tunnel via the access shaft and drain at the north-east end would be impractical. Instead the intention is to remove the concrete cap from the only ventilation shaft, located adjacent to the blockwall at the other end. 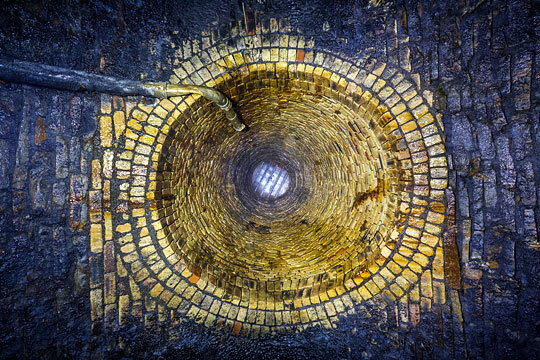 This is 7 feet in diameter and 58 feet deep. A three-strong group from Hammond ECS, the framework contractor acting for HRE, entered the tunnel separately to take measurements. Their work is being funded by a £10,000 Welsh government grant to the Society. 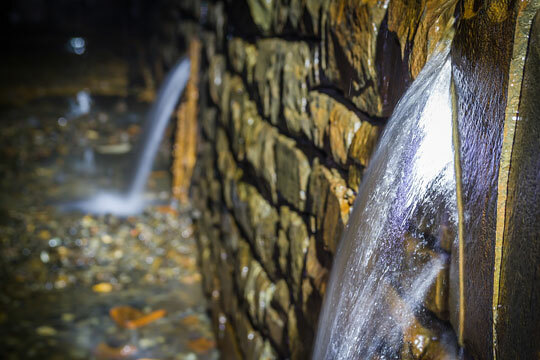 Crawling out of the drain, you are immediately struck by the noise of running water entering through the arch and sidewalls about 70 yards ahead, then flowing away via the old track drainage. 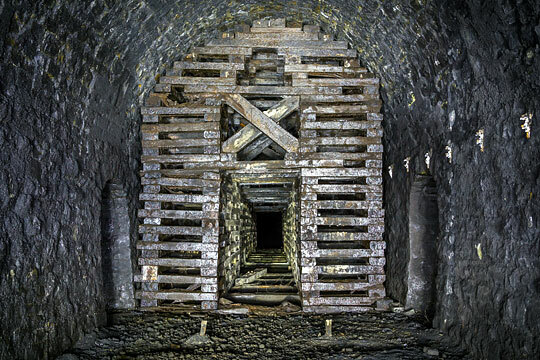 Records indicate that construction shafts were sunk close to the portals to assist with driving the headings; as built, the tunnel is 132 yards longer than was originally planned so it’s possible these still exist behind the lining, effectively acting as sumps. Underground springs are also recorded. Whatever its source, the water has caused deep open joints for much of the first 300 yards. The remains of a distant signal in one of the refuges. The impact of mine workings both above and below the tunnel was first observed in the 1930s, resulting in distortion of the stonework. Over the following 20 years, this triggered the imposition of a speed restriction, some localised relining and the installation of around 300 steel strengthening ribs; these would resist lateral loading and the consequential pushing-up of the crown, but were not entirely effective. Many of the associated laggings have since become rotten and fallen, revealing patches where the masonry is missing. The worst is behind you as the longest collection of ribs is passed, after about 230 yards. Beyond, the tunnel is generally dry and benign, passing beneath Mynydd Blaengwynfi at a depth of more than 900 feet. At the time of Colonel Rich’s inspection for the Board of Trade - prior to the line’s opening in 1890 - around 22% of the tunnel’s 3,443-yard length had been left unlined, a function of engineer Sydney William Yockney’s confidence in the Pennant Sandstone through which the tunnel was driven. However Rich refused to authorise its use for passenger traffic until a full lining was provided, prompting contractors Lucas and Aird to energetically set about inserting arched sidewalls and a brick arch through the offending areas. It took just eight weeks. Some sections of sidewall were built in concrete and localised deterioration is now apparent, although the defects are few and minor. Continuing south-westwards, progress is impeded by a ‘cog’, assembled in timber and occupying the full profile of the tunnel at a location where the arch is severely hinged at the high haunch. It comprises three separate supporting structures to resist any further distortion of the lining and prevent falling material from blocking the passageway. Although the timber is now mostly hollow and rotten, it appears not to make contact with the stonework, suggesting that the movement here has long-since stabilised. The only shaft will have its cap removed to become the primary means of access. Dampness and water ingress return occasionally for the last 500 yards, washing away the soot which coats the lining elsewhere. Tucked into a refuge are the remains of a distant signal - permanently fixed at Caution - with its batteries scattered about. Journey’s end is the blockwall, in front of which lies a pile of debris, formerly the ventilation shaft’s chimney. Soon this will be the landing point for Balfour Beatty’s examination team whose verdict will go far to determining the campaign’s prospects. Rhondda Tunnel is a feat of very significant proportions; completed against the odds through grit, tenacity and ambition - characteristics embodied by the fearless Victorian engineers without whom we would have no railway network. Its closure came at a time when the future looked different; so was the prevailing culture. We are, thankfully, more enlightened these days. The visiting party comprised members of the Society's technical sub-committee, a Balfour Beatty engineer and a Mines Rescue team. It’s a curious reality, but there has been an awakening to the transformational potential of old tunnels in terms of tourism and improved connectivity. Who would have thought it? For proof of that, head to Bath or the Peak District where several have been successfully repurposed over recent years. In the valleys of South Wales, they could also offset the persistently lingering legacy of industrial decline. 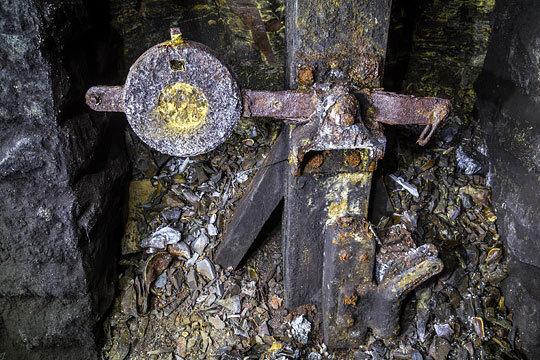 Superficially, it’s difficult to see any engineering show-stoppers standing in the way of Rhondda Tunnel’s return; for the most part, it faces the sort of challenges that are routinely managed in operational railway tunnels. Positive engagement by all parties has given the campaign momentum, with more and more people engaged by the vision. It’s certainly an uplifting one. Let’s hope those in authority can buy into it too.